Application: To size bi-laminated panels, with perfect finish on both sides without use of the scoring saw blade. Machines: Vertical saws, panel-sizing machines, portable machines. Material: Double-sided panels with extremely fine coatings, veneered panels. Ideal For: Heavy-Duty Crosscutting Blades Designed For The Industrial Cabinetmaker. 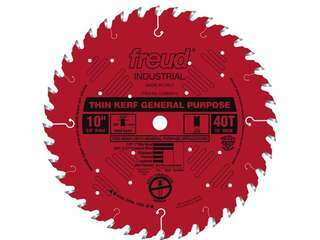 Depth of cut (1/2" min to 2-3/4" max). 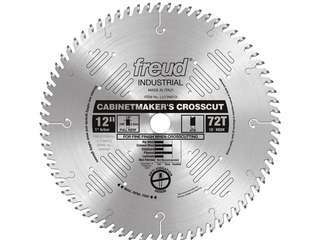 This heavy-duty crosscut blade is designed primarily for heavy use in a cabinetmaker’s shop. Combining a 10° hook angle and the alternate top bevel tooth grind, this blade provides a good crosscut and long cutting life in hardwood, softwood, plywood, and chipboard. The LU73M series is ideal for cutting a wide variety of materials most commonly used by cabinet makers in thicknesses from 1/2" to 2- 3/4" thick. Ideal For: Ultimate Cut-Off Blades For Glass-Smooth Finishes With Underpowered Saws. Depth of cut (1/4" min to 1-5/8" max). 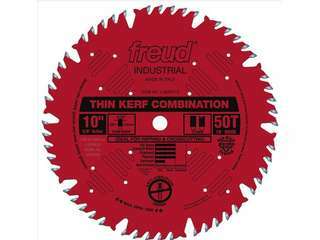 This thin kerf blade produces glass smooth surfaces when crosscutting hardwoods and softwoods, thanks to Freud’s unique side grinding technology. 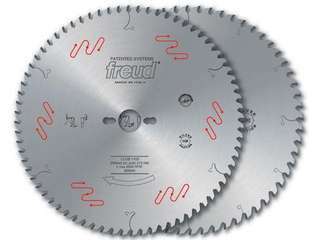 The larger blades are ideal for miter box applications. Ideal For: Flawless Finish In Veneered Plywood, Chip Board, Melamine & Laminates For Virtually Chip-Free Cuts. 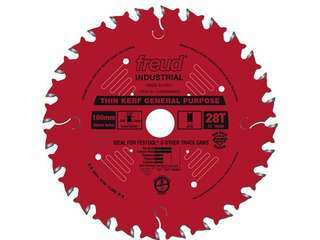 The LU79 thin kerf line of saw blades provides flawless, chip-free edges in veneered plywoods, fine moldings, melamine, laminates, and crosscuts in solid woods. 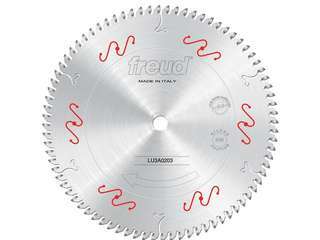 Using advanced technology, Freud developed the LU79 thin kerf line of saw blades that features laser-cut, anti-vibration slots that practically eliminate the vibrations that resonate in standard blades. This blade provides flawless, chip-free edges in veneered plywoods, fine moldings, melamine, laminates, and crosscuts in solid woods. 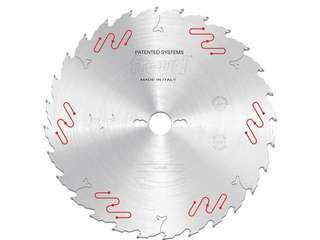 The combination of Hi-ATB tooth design and anti-vibration slots makes these thin kerf blades the ultimate finish blades. 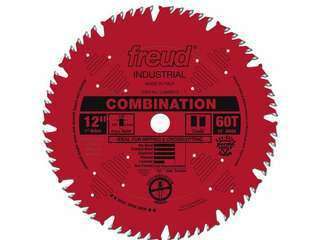 The result is a cut so smooth it eliminates the need for a stabilizer or a scoring blade! The LU80 saw blade provides flawless, chip free edges in veneered plywoods, fine moldings, melamine, laminates, and crosscuts in solid woods. 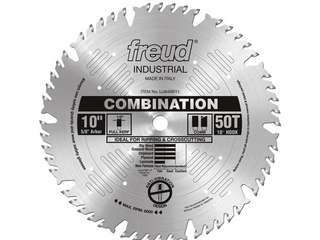 Ideal For: Flawless Finish In Veneered Plywood, Chip Board, Melamine & Laminate - Depth of cut (1/4" min to 1-5/8" max). The ultimate combination blade is now available in a thin kerf design for less amp draw and reduced material waste. This ultimate combination blade combines one flat tooth for ripping, followed by four alternate top bevel teeth for crosscutting and a large gullet for effective chip clearance. With this ultimate combination blade, there is no need for stabilizers. Ideal For: Ultimate crosscutting blades for glass-smooth finishes when crosscutting hard and soft woods, so no sanding is required. This Ultimate Cut-Off blade's teeth actually polish the material as it cuts. New laser-cut anti-vibration slots practically eliminate the vibration that resonates in standard blades, producing glass-smooth finishes. With a finish this perfect you won’t need stabilizers! This Ultimate Cut-Off blade's teeth actually polish the material as it cuts. New laser-cut anti-vibration slots practically eliminate the vibration that resonates in standard blades, producing glass-smooth finishes. Ideal For: For Heavy-Duty General Purpose Applications. Crosscuts (3/4" to 3-1/2") & Rips (1/4" to 1" ).